Uncertainty is a theme that we see throughout this poem. We can recognise that almost all of the poem has a sense of ambiguity, this is as Heaney can never be sure of what his emotions or his surroundings are. A quote which suggests uncertainty in the poem is when Heaney says "his cap was upside down." This is because it illustrates a sense of turbulence running throughout Heaney's mind and advocates that he cannot make sense of his surroundings. Upside down literally describes the positioning of the policeman's cap, however metaphorically this may imply Heaney too is upside-down and can't seem to foreshadow what is to come. Perhaps this is because the policeman was dangerous, or even because Heaney's view of Protestants had been tainted by his parent as he grew up to see Protestants as rancorous. Perhaps the most central idea apparent in the poem is fear. Constantly throughout the poem Heaney is fearful of the policeman. This fear was brought about by the accessories of the policeman. For example the quote "staring at the polished holster" signifies Heaney was petrified at the sight of the holster- which holds guns. If the constable had a holster then he had a gun and Heaney was worried the policeman would turn violent if he didn't get what he wanted. We also know how scared Heaney is, which is perceptible from the great detail he talks about the gun. Despite the event happening several years ago Heaney was still able to describe the policeman's items such as the gun and his bike very vividly. He has never been able to evade the fear of the event, similarly to Heaney's other poems including: 'Digging'; 'The Early Purges' and 'Blackberry picking'. 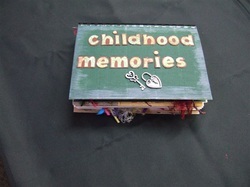 The third key theme identified is childhood memories. In the poem above and in 'Follower' and 'Mid-term Break' they all share the theme of childhood memories. These childhood memories have shaped who Heaney is today. We can tell his poem has been written from his childhood by the fact the policeman was never described, yet all of his accessories were. It displays Heaney couldn't remember much about the policeman because he was too petrified to look, if he was scared of the policeman's bike, then how scared would he be looking at the policeman himself? "He stood up, shifted the baton case" suggests immediately has a sense of fear and adumbrates the policeman turning violent because he had a baton. This was the way Heaney's Catholic family and community influenced how he saw Protestants such as the policeman. Would the constable count as a theme? This situation can be studied at from different perspectives. On one side, the policeman cannot be considered a theme as he is a character within the poem and therefore isn't representative of something else. However on the other hand, he could, this is because a theme is a topic or subject of talk. The policeman is most definitely a key talking point when trying to decode the meaning of Heaney's poem. He could also perhaps be considered a theme is the sense that he is not mentioned within the poem; Heaney only talks about all of the objects that belongs to the policeman. In this sense these objects are representative of the constable and the law in Ireland. I think that whether or not you would describe the police officer as a theme is entirely down to what you believe it is or not. There are many different reasons to suggest that actually the policeman isn't even a policeman but rather just another one of Heaney's fears he portrays through the policeman. In doing this we get an indication of what this fear is if it is a metaphorical policeman - unsound and daunting.